I have the previous version! Not too bad a concealer, just that I seldom use it because I'm using another one (Canmake's!). Pretty good coverage. I'm not sure if there's a difference in the formula, but the applicator is definitely different! Comes with a cute ball tip :3 as compared to the previous doe foot. Interesting! Same formula as previously I guess? Better coverage, but higher chance of being cakey and dry. Not so suitable for concealing the undereye area though it provides better coverage. Comes in 2 variants: one for blemishes, one for undereye circles. 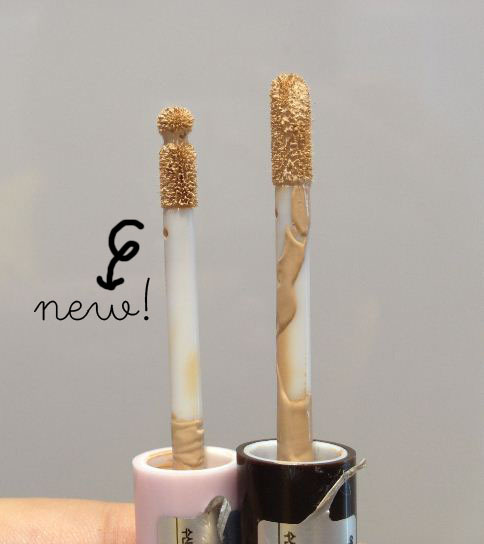 As these are relatively new products they didn't use to have in their concealer range, thought I'd talk more about it. 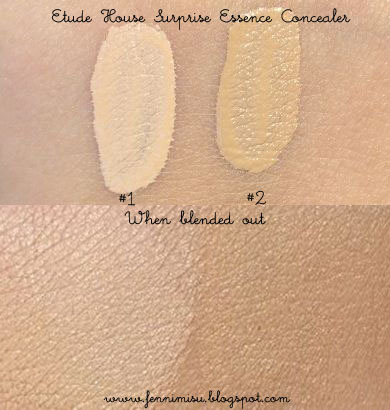 I bought the one that conceals the undereye darkness cos I need 'em :( It was too light for my skin tone! But I applied a smaaaaaaalllllll amount and it looked okay. The website said to apply the salmon coloured one, then to layer the beige on, and I did. It did improve the darkness below my eyes :3 Not drying too! Infact it feels pretty moisturizing. I havn't tried the one that covers blemishes yet, will let you guys know soon! nice.. I'm looking for this. Thinking about the kit, how is it for blemishes?